Until yesterday, I’d never made a successful pumpkin roll. I was in charge of bringing one to Thanksgiving about 3 years ago. I made one, and it ripped when I rolled it. So I made another one, and that one ripped too. I wrapped up the mangled pumpkin roll. Put it in a cooler and drove to Thanksgiving. Needless to say, it was one ugly dessert, and I think the kids were scared of it. So when my mom came over this weekend, and suggested making a pumpkin roll, I knew it was meant to be. I knew that with my mom here it’d come out looking good. But yeah! I totally get it now. You have to let it cool, but not until it’s cold, or it’ll rip for sure. And you have to have cake patience because you have to take the wax paper off slowly, and roll it up in the towel even slower. So happy fall! 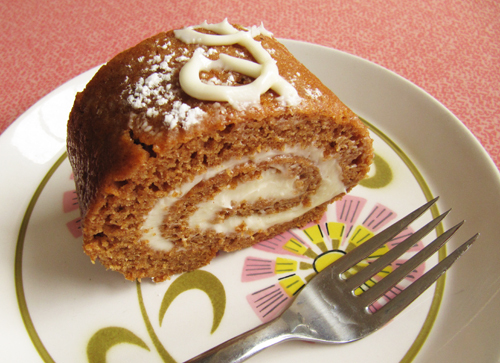 Let’s eat pumpkin roll for every meal, want to? Preheat your oven to 350°F. Spray a jelly roll baking sheet (15.5″ x 10.5″) with cooking spray. Line with wax paper and spray again (don’t forget the sides). Set aside. Beat eggs on high speed for 5 minutes, or until frothy. Add sugar and mix until combined. Stir in pumpkin, spices, flour, baking powder, and salt. Spread in prepared jelly roll pan, and smooth as much as you can. Bake for 25-30 minutes, or until cake springs back when gently pressed in the center. While the cake is baking, generously sprinkle a kitchen towel with powdered sugar. Remove the cake from the oven and turn out onto the sprinkled towel. 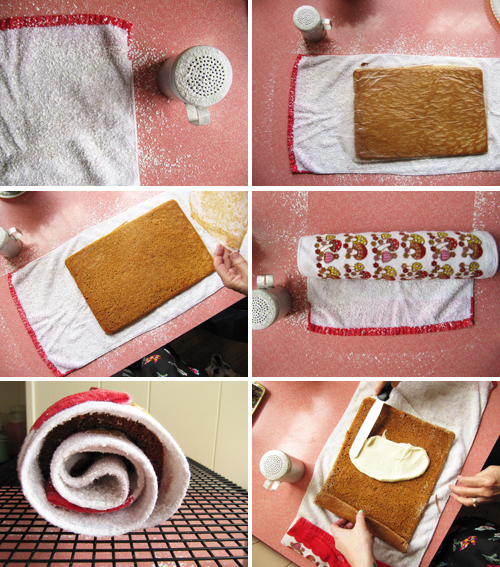 Peel away the wax paper, and roll cake and towel up together (roll up the shorter side, not the long side or you’ll have one long skinny pumpkin roll, like in the photos above) to cool for 30 minutes or until mostly cool, but not cold. Make the cream cheese filling, by beating the powdered sugar, cream cheese, butter, vanilla, and maple syrup together. Unroll and spread with filling. Re-roll up and sprinkle with powered sugar. Slice and serve, or wrap in plastic wrap and chill until time to serve. Hostess cupcake swirls for life! I’ve only made one in my life… it came out ‘ok’ it was a little thin luckily no cracks or breaks. I need to master it though it is my husbands favorite fall dessert! Your’s looks fantastic! I have total confidence in you Carrie! Your mom just knows how to roll I guess! 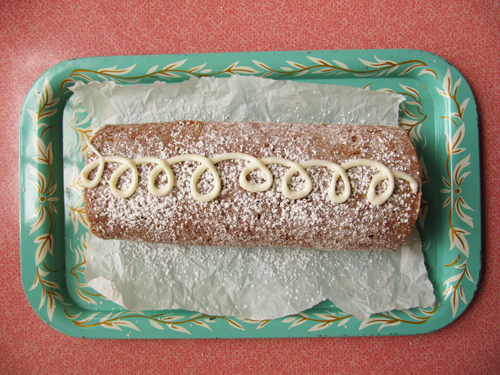 This looks so pretty and tasty too…I’m glad you overcame the jelly roll! I’ve never even tried to make one, but maybe this will be the year. She can totally roll up a cake with the best of them. Skillz man. Yummm! Picture perfect. Have fun with your mom. Hi Mrs D! I’ve never attempted the roll and coincidentally my boss and I were just talking about a pumpkin roll and how neither of us had ever made one! I sent her this link 🙂 As always, dig the swirls! Nicole! You should totally make it! Oh I can totally relate about the trifle business. I hope it rolls up perfectly for you though! Hi, I’m wondering what state the pumpkin is in when you add it? Is it raw, grated? Or roasted & mashed? 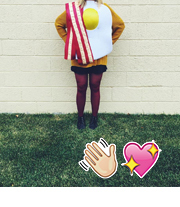 Sorry – this might seem obvious but I can’t figure out how to use the pumpkin. Could you let me know please? Thank you! I will be making this (my first attempt) this Saturday. It is my boyfriends favorite and he has requested it so wish me luck. Your recipe appears to be very detailed and simple not to mention the photographs give me great encouragement that this is one dessert I can make with ease! Thank you! I cannot wait to try this!!! Oh my gosh, my mom makes this every fall and it’s so good! Yes! Mom’s are really good at pumpkin rolls. Maybe someone can help me. When I’ve made these before the fuzz or strings on the towel have come onto the pumpkin roll. How can I stop this? Thanks for any help because we love them around here. Hmmm… I always use the less fuzzy side of the towel. I’m not sure! Or use a brand new one that isn’t too fuzzy-ful. Good luck! Is the “t” for table spoon or tea spoon? is the “t” for tablespoon or teaspoon? I have very good directions from a book and tried several times in the past. Guess, I did ok. My DS birthday is in 2 days and he’s requested this for his cake! My tip: if it rips: frost the whole log! Frosting covers a mutitude of rips! Way to be! Love the idea of frosting the whole thing. I have been making these for years and they are always a big hit. I usually make 2 at a time so that I don’t waste a can of opened pumpkin, then I keep one and give one away. Good idea! 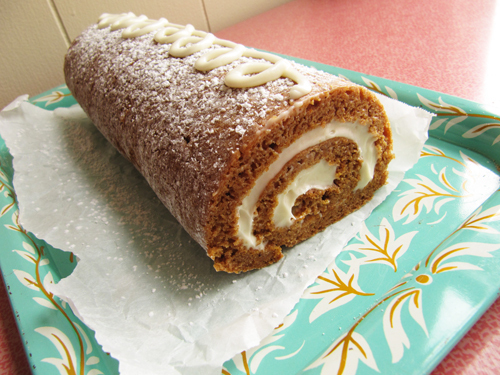 I would love to get a pumpkin roll as a gift. If I wanted to make these ahead of time to take for family get-togethers, how long would they keep and how would you suggest keeping them? Freeze them or just refrigerate them? Thank you for the great recipe! I was searching for some new pumpkin recipes to try and found yours. I featured it, along with some other pumpkin recipes (http://mylifeasrobinswife.com/2012/11/11/the-perfect-parade-of-pumpkin-possibilities/) on my blog yesterday. I can’t wait to try it! Blessings! Diane from My Life as Robin’s Wife. I made this yesterday and it turned out great. I only cooked it for about 12 minutes though and it was definitely done. A quick note for those of you who want to make it ahead. I put mine in the freezer wrapped in plastic wrap. I wanted to make sure it was okay so I sliced off a bit of the end to take a taste. It’s delicious. So you can definitely freeze it! Thanks for the recipe. 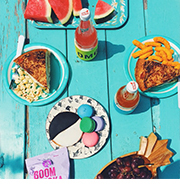 I’m from Australia and a friend of mine put this on her FB page and it looks delicious. What does “scant 1 T pure maple syrup” mean? I understand 1 tablespoon pure maple syrup but what does scant mean before it? 30 Pumpkin Recipes for Fall « A Cedar Spoon.